Silat Lift Kicks are a nice and relatively simple tool that you can use to defend yourself. Think of moving your leg the same way that you would to move a box that is sitting on the floor with your toe. Simply reach out and push the box without any extra movement or telegraphing. However, the internal aspect of lift kicks is very important. The idea is to get the weight of your leg and ideally your whole body weight into the kick. I can also not overstate the idea of not telegraphing the kick. A lift kick comes straight up from the ground and ideally will not be see by an opponent. The lift kick can be aimed at the bottom of an opponents knee or at the groin from underneath depending on your height and flexibility relative to their height. A lift kick can also be used to tag the front of the opponent’s shin and cause them to pitch forward. However, with proper execution the lift kick to the shin can also be used to break the opponents leg. To get the proper amount of leg and body weight into a lift kick first let the leg hang from your body and continuously swing it back and forth so that the leg weight is present but there is almost no tension in the leg. All of your body weight is on the other leg and you are working to make sure that the swinging leg has no resistance to moving. 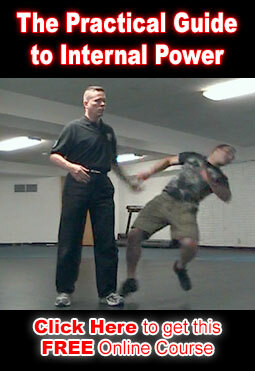 This is the first and most important aspect to master for throwing a serious and powerful lift kick. Once students learn this kick then ideally it is paired with Cloud hands arm movements so that there is an upper body and lower body art happening at the same time. For this purposes the basic application of the cloud hands are almost all arm breaks. However, when combined with the Lift Kick the bottom arm is used to cover the groin area at the apex of the kick and upper arm is used to redirect any reaching strike that is incoming at the point of contact with your kick. 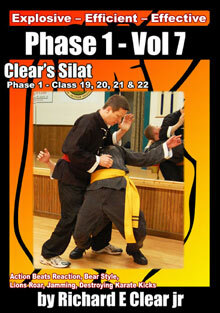 For Phase I in Clear’s Kun Tao Silat it is most important that the Lift Kick be learned well enough that you can throw it in a wide variety of circumstances when you need or want it without telegraphing the kick.